Librarians and staff, Villanova University faculty and the University president himself—the Rev. Peter M. Donohue, OSA, PhD, ’75 LAS—assembled in the library’s Speakers’ Corner on May 14 for the 9 a.m. presentation of the 2013 Association of College & Research Libraries (ACRL) Award for Excellence to Falvey Memorial Library. The award ceremony kicked off a day-long, library-futures symposium, featuring lightning talks by 31 presenters, and concluding with an evening reception that included live music. 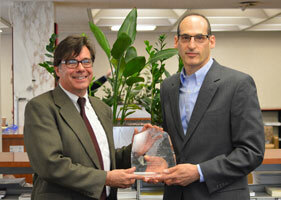 Joe Lucia, University librarian and library director, and Steve Bell, ACRL president, show off the ACRL award. Joe Lucia, University librarian and library director, welcomed attendees to “a celebration of Falvey [Memorial] Library and its staff.” He then reviewed criteria for the ACRL award and highlighted factors, such as our Learning Commons and our contribution to the University’s intellectual life, that caused Falvey to be chosen. President of ACRL, Stephen Bell, presented the award to Father Donohue. Under Joe Lucia’s leadership, Father Donohue remarked, the Library has become a place in which “students want to be [rather than feel that they] have to be,” adding that the “Library is central to what they do.” The Library, he continued, “is a place where [students not only] gain knowledge [but also] knowledge of themselves.” Father Donohue observed, “Falvey Memorial Library is at the center of campus, both physically and intellectually,” before thanking Lucia for his stewardship. Pat Adams, representative of Yankee Book Peddler, Inc. (YBP), the award’s sponsor, presented Lucia with a check for $3,000. Mr. Darren Poley, University librarian and interim director of Falvey Memorial Library, concluded the symposium by sharing two themes that emerged from the presentations: collaboration and the value and importance of libraries. Attendees then moved to the Falvey Hall (aka “Old Falvey”) reading room for the ACRL Award reception. In addition to Villanova University faculty and Villanova School of Law library staff, guests arrived from West Chester University, Bryn Mawr College, Temple University, Drexel University, Stockton College and the Philadelphia College of Osteopathic Medicine. Family members of Falvey employees and two retired Falvey librarians also joined the celebration. 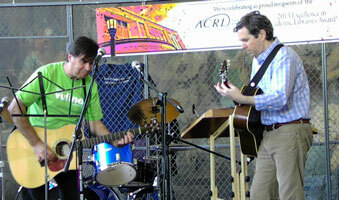 Joe Lucia and Jesse Flavin, members of Marc Fields and Bad Data, work on a number at the ACRL Gala.